Give.Go.Do — Traveling Coaches, Inc.
Give. Go. Do. These are the words that inspire us to give back to our communities in the office, around town and across the globe. We believe it is our greatest privilege and responsibility to give of our talents, time and treasure to serve others. As one of our core values, Generosity is so important to us, we have an annual company goal for team members to Give. Go. Do. during work hours as well as their personal time. These efforts result in an average of well over 1,500 service hours donated per year by Traveling Coaches employees. From the American Cancer Society to World Vision, we’ve partnered with dozens of local and global charities to influence over $100,000 in monetary donations. 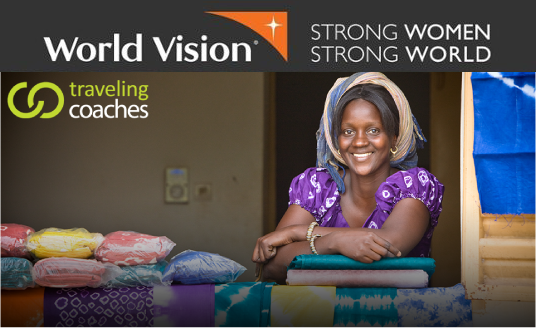 Traveling Coaches is a proud partner of World Vision Strong Women, Strong World. As a woman-owned business, Traveling Coaches is invested in the success of other women. That's why we're a proud supporter of World Vision's microfinance initiative, Women’s Empowerment Fund. We're touching lives, businesses and communities. Join us! Contact us to become a micro loan donor and be a part of helping women and girls around the globe break the cycle of extreme poverty. Traveling Coaches is proud to sow our resources broadly into many organizations.